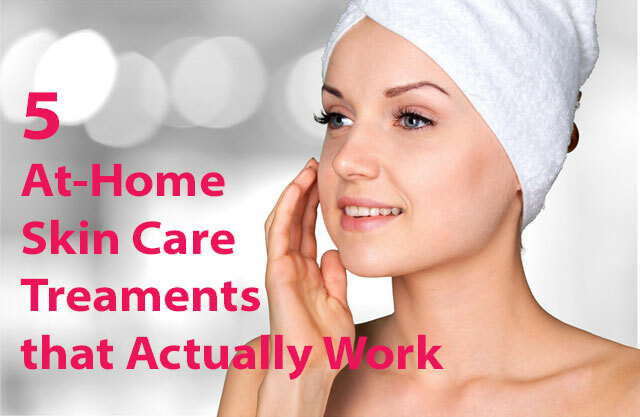 At-home devices for skin care treatments are everywhere, and I'd say that's a good thing. As a beauty editor, I've been testing these gadgets for years and have found that they get results and are much more affordable than doctor's office treatments. For instance, an effective at-home wrinkle-reducing laser, like those by Tria, runs from $250 to $350, less than a fourth of the cost of a series of in-office treatments. The improvements come slowly and will never quite reach doctor's office results because manufacturers make them less intense to keep them safe. But you will see appreciable results. Not all skin care devices are created equal though. So I tested the following five products over a few months. In the end, I found that they're all worth it. In the beginning, using the Tria Age-Defying Eye Wrinkle Correcting Laser is all about the zing — the tiny zap of pain you’ll feel while the device is working. The Tria is a fractional laser, a gentler version of the skin-smoothing treatments doctors perform. Pass the device in circular motions around the eye, from the crow’s feet down around to the inner corner of the eye. The light from the laser creates tiny wounds deep inside the skin. Your body’s natural healing process stimulates collagen production, which eventually smooths lines on the face. It’s not terribly painful, roughly comparable to being snapped by teeny rubber band — a pinhead-sized area of sensation. But the undereye area is very sensitive, and the zaps occur continuously. When I first started using the Tria, I had to stop in the middle of each one-minute treatment session. After about a week, the sensation seemed to hurt less. Perhaps my eyes got used to the feeling. I experienced a little redness around my eyes too, but that always cleared up by the next morning. The lines around my eyes weren’t very deep to begin with, but I certainly wanted to make them shallower. Nothing seemed to change until about week six, when I noticed a slight smoothing of my crow’s feet. Tria suggests eight weeks of treatment, with four weeks off after that. True to its word, that was pretty much the timeline of my experience. After week 12, the four main crow’s feet (two on each eye) were smoother. This treatment takes commitment without much pay-off at first, but the results are worth the wait. I liked the idea of the Luna as a gentler alternative to the cleansing brush. I’ve found those too harsh for my skin, which is acne-prone and at times sensitive. The Luna 2 vibrates rapidly; the sensation in the hand is similar to a Sonicare toothbrush. Apply cleanser to your skin, then wet the Luna and pass it over your face in circular motions. The device vibrates for one minute. The only way I could see justifying the expense of the Luna is if it did a better job cleaning my skin than soap and water alone. And it did. I typically double cleanse my skin, first with an oil and then with a cream cleanser. The one-minute Luna routine cleansed my skin just as well as my oil-and-cream technique. I measured the effectiveness by simply wiping my face with a white cloth after cleansing. After the Luna, there was little to no makeup on the cloth. The Luna also gently exfoliates, which I really liked. I gave the flakiness around my mouth and chin a couple of extra passes with the Luna. The dry skin gently sloughed off. After about four weeks of use, I hadn’t noticed the anti-aging benefits the Luna is reported to have. But I did feel like cleansing was easier and more thorough. I’d recommend the Luna to those who like cleansing devices but are too sensitive for brushes. This handheld device treats acne with LED blue light, penetrating the skin to kill pimple-causing bacteria. I used the Quasar light for about three weeks and saw an improvement in my acne. The process is simple and painless. Make light-to-skin contact and pass it over the face continuously during the treatment time. Like most light treatments, the Quasar requires daily use, and it’s quite a lot: 12 minutes total per day. The instructions say to divide the face into three sections horizontally. Each section requires four minutes of treatment. I cheated a little and only treated the sections where I get the most acne, from my cheeks down to my chin, for eight minutes total every day. One thing I didn’t like: The Baby Blue must be plugged in to operate, which limited the locations where I could treat my skin. Battery-powered devices can't deliver the intensity you need, according to the company. So keep in mind that the cord is about 6 feet long. You many need an extension cord in order to enough to hang out on the couch and blue-light your skin. For acne sufferers, this inconvenience is minimal because the results great. I usually have a breakout once per month. The month I used this — no breakout. This blue light is a much-needed treatment option for those with chronic skin issues. 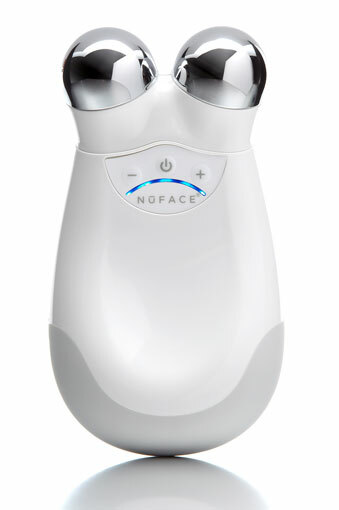 The NuFace Trinity Facial Trainer Kit is said to use currents to stimulate the skin’s collagen and elastin production. It is also reported to work the muscles of the face, which in turn decreases sagging. Unfortunately, I didn’t see this kind of results with the Trinity. But there are two major factors that I’m sure affected my results. First, I don’t have sagging skin. I’ve been told by aestheticians in the past that microcurrent technology works best for tightening issues like jowls or sagging lids. Also, Trinity suggests using the device daily for 60 days to see full results. I used it for four weeks and didn't see change to my skin. However, I gave my 68-year-old mother the device to try, and she said she noticed improvement in sagging around the outside of her eyes within three weeks. The device is quite easy to use. The only mildly unpleasant part is the pretreatment gel. You have to treat your skin in sections and apply the gel to each before you use the device. The gel is a bit goopy, and you have to wipe it off after you’re done. For someone like me with acne-prone skin, it’s nerve-wracking to put something on my skin that’s not meant to treat or prevent blemishes. This anxiety was all mental, though. I didn’t see any impact on my skin from the gel. The microcurrent is painless and doesn’t feel like much of anything. Every now and then, the device felt pleasantly warm or tingly on my skin. Because it’s so easy to use — treatment only takes five minutes — I’ll likely keep using the device for preventive purposes. Gazing into my face at 5x magnification, bathed in simulated sunlight, was terrifying at first. I slipped into self-critical mode (“Oh man, those pores”) but quickly snapped out of it. The magnifying mirror is about accuracy and efficiency, not face shaming! I have a peach-fuzzy face that has never been subjected to lasers. The Simple Human 8-Inch Sensor-Activated Light Vanity Mirror helped me see every little hair, exactly where I needed to trim and pluck. The mirror is circled by sunlight-simulating light that turns on when your face approaches. This illumination helps with hair removal, too, but its value is most noticeable while applying makeup. For example, I learned that the pinkish tone of my concealer works well for undereye darkness and other deep hyperpigmentation, but that for other flaws, this concealer is too pink. I usually apply it all over my lid, but I noticed in the mirror that when applied above my crease, the results were bad. I hadn’t noticed that before my Simple Human gaze. I also fell in love with my foundation, realizing in Simple Human’s bright light that the skin tone match is very good, and the coverage is light but evens things out. 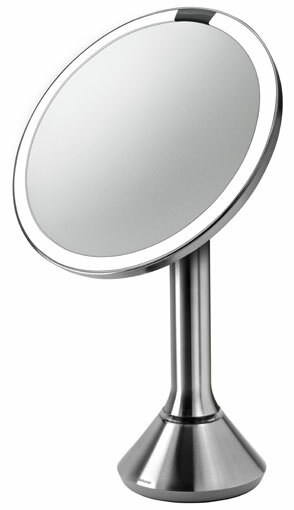 I would definitely recommend this mirror for makeup-wearers and bare-faced beauties alike. There’s something here for everyone. Once you get a makeup routine down, you might not need the Simple Human every day. I feel like it’s more of an analysis tool because of the magnification. But if you don’t have great light in your home, the tone of the mirror’s light helps. How about using Sun Screen and/or staying out of the Sun….that works much better than these items and costs less!! What is your relationship to these companies? Did you receive any compensation? Did you receive these products free of charge to keep? Hi Aimeslee, we didn’t receive any compensation for this story nor did we receive the products in exchange for a review. This is an editorial article where me made the product inclusion decisions based on our editorial judgment. Any time we do a sponsored post, that will be clearly disclosed at the top of the article (e.g., Sponsored by Company X).